Do you ever have problems like these? I came to work at about 8:30. Did I start working for the client right away? Then I went to lunch at around 12pm and I think I was gone for about an hour... or was it more? Today you worked for your client for 4.5 hours. Data, which ManicTime collects, is stored on your machine and not sent anywhere. It is not shared with us or any third party and exists only on your machine. 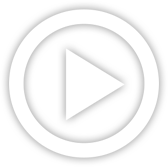 ManicTime is not a cloud based service, instead it uses a local datastore, so all recorded data will be kept on your machine. This also means that it will work the same with or without internet connection. All the data ManicTime collects will be presented in a easy to understand graphical interface. This will help you to quickly figure out when you went to lunch and when you've switched tasks. From now on, your logged hours will be accurate and simple to track. From the hours you logged its easy to create almost any kind of report. Once you create the report, you can easily copy it to Excel or some other tool and create an invoice there. ManicTime can integrate with task based systems, like Jira or GitHub. You can use ManicTime to enter your work hours, then send the timesheet back to specific issue. Use ManicTime in your company or your team. ManicTime Server will collect all data and generate useful reports. ManicTime captures a lot of data and you can use this data to create work activities. For example you can say that all facebook activity is "Browsing" and that all MS Word usage is "Work". Equally important as tracking computer usage is tracking non usage. When you step away from the computer, ManicTime will track this as Away time. When you return, you can create a note of what you were doing during Away. ManicTime allows you to keep up with your employees’ work, send accurate progress reports, and manage your time better than ever before. This kind of software can help your business be more efficient when it comes to internal employee affairs as well as the external partnerships. ManicTime is the best time tracking software to help your business manage time, resources, and information better than ever before. 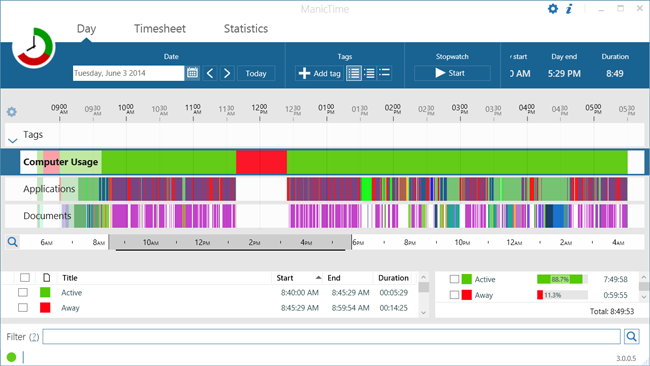 ManicTime is a time tracking software that is downloaded onto your machine. If you are using ManicTime throughout your business, you can download it on your internal server and install it on numerous computers, as the licenses are issued per user. This tracker allows you to compile information regarding computer usage throughout your company to see what employees are spending their time on, what projects are being worked on, and what applications are being accessed. ManicTime can be used on and offline, making it easy to work from wherever you are. Since ManicTime is located on your server or your individual computer, you don’t have to worry about your sensitive data getting out as the result of a breach or a hack. Data from ManicTime is stored locally, unlike many other time tracking software applications that store data in the cloud. More than that, ManicTime can be integrated into many software applications that you may already be using. This keeps all your essential data in one place so that you can continue to improve how you do business in concrete ways. Our time management software can be downloaded onto your individual computer, or you can choose to have it on the computers of your employees. Individuals who are self-employed may find that using ManicTime increases their productivity. Studies have shown that we work better when we know we are being tracked, so ManicTime can help keep you on task and working effectively. Time tracker software is also beneficial for businesses, large and small, that work with freelancers, contract employees, and remote workers. When these employees are not physically located in the same space as you or the rest of your team, it can be difficult to track their progress on essential projects. To keep your business running smoothly, it helps to be able to keep all your employees accountable for their work. ManicTime allows you to track what projects your freelance or remote employees are working on and, more importantly, how much time they are spending on that task. The tagging capabilities of the time tracking software tell you what each user has been working on and that they are billing you for the correct amount of work. Without computer tracker software, money may be lost to employees who do not track the correct amount of time they are spending on work. This feature assists you with both billing and payroll. Tracking your freelancers’ time keeps you up to date on the tasks they are working on, provides you with a detailed progress report, and gives you the ability to send their work along to your clients to make sure they are heading in the right direction with the assignment. This minimizes communication errors and helps clear up any difficulties along the way. Project managers and supervisors can also benefit from using ManicTime. If you oversee a specific department or manage several employees, ManicTime allows you to see what those employees are working on in real time. You can supervise without staring over your employees’ shoulders, and see where resources and manpower may need to be used differently in some cases. Most of all, the reports that ManicTime sends with the data gathered from computers can be used to show clients the progress of their projects, send regular progress reports to your bosses, and show the proficiency and efficiency of your team. There are many features of the ManicTime software that benefit businesses both large and small, working in many different industries. ManicTime’s features are customizable, making it easy to gather the information you need that is unique to your job and relevant to you. At any point, you can alter these settings and change ManicTime to grow and change with the needs of your company. ManicTime works both online and offline. This benefits employees who are working as freelancers or remotely, as they can do their jobs from anywhere in the world regardless of internet connection. Since the computer tracker software is downloaded on an individual computer or your internal business server, the information you are working on is not easily available to third parties. ManicTime does not store any of the data that it gathers and no information is stored in the cloud, all information is retained on your local machines. This increases the safety of your information and the security of the software itself. The detailed tracking capabilities of ManicTime also makes it easier for your business to track down sources of a system malfunction. If an unsecured website or application has been accessed, you’ll be able to see this data in the ManicTime dashboard. If any sensitive information is leaked, ManicTime may be able to help find out how that happened and mitigate the effects of that breach. ManicTime starts tracking your time automatically. This allows a team manager or supervisor to know exactly what time their employees are sitting down to their desks and starting to work in the morning. Sometimes employees may clock into work, but do not actually start working until they have their morning coffee and catch up with some of their co-workers. Having a computer time tracker software installed allows a business to monitor their employee’s attendance and pay them for work that is being done. Additionally, a time tracking software can assist your business with payroll. ManicTime’s automatic functions give you a real-time record of your team’s work, which makes it easier to corroborate with salaries at the end of a pay period. This can be especially helpful if some or all your employees are being paid an hourly wage. Using an automatic time tracker software eliminates the chance that an employee will forget to turn on the software when they are working. Manual trackers can be harder to get used to, and some people may not remember that they are supposed to be tracking their time and tasks. This leads to errors in payroll and periods of time that an employee couldn’t account for during their workday. Our automatic time tracker doesn’t mean that you give up your ability to manually use the application, however. Users can start and stop time when they are planning to take breaks and can switch between tasks they are working on during the day. ManicTime users can prioritize certain projects and choose from a list of regularly accessed projects, especially when working on tasks that are more long-term. ManicTime also allows you to auto-tag the screenshots that it takes and records for its regular report. This feature gives you the ability to clarify what you are working on, what stage of the project you are in, and why it is important. This can be incredibly beneficial for status reports on projects within your company, as well as updates for clients who are wondering how their work is coming along. Auto-tagging makes it easier for a team manager, supervisor, or client to know what they are looking at, amplifying the usefulness of the time management software. ManicTime collects data related to computer usage. When ManicTime starts up, it records what websites are visited, what applications are used, and how much time is being spent on certain projects you may be working on during the day. Users can receive ManicTime reports when they want them and can customize this setting to best fit their goals. These regular reports show you what your team is spending their time on, what projects are nearing completion, and where changes could be made in your business structure to make things run more efficiently. The reports that ManicTime generates and sends also allows you to share this information with other departments within your company. You are all sharing the same pool of information, but some areas of your business may be able to benefit from some information over others. Together, all the areas of your company can come together with this data and use it to create a better way of doing business. Additionally, our time management software can be integrated with a variety of other software applications that you may already be using in your day to day work. From payroll software to Excel, you can integrate ManicTime into your existing applications to build a successful collection of software that works together seamlessly. Any company that works with computers will benefit from the use of time tracking software. No matter what industry you work in, your company could be a step ahead of the competition with these software solutions. ManicTime can help improve your efficiency, your productivity, and your overall work environment. The team at ManicTime is committed to creating a great product that helps you be more productive and accomplish more for yourself and your business. ManicTime offers its services for individuals who want to make their lives easier, and for businesses that need to track multiple employees and their outputs on a regular basis. If you are curious about the different features of ManicTime, check out our helpful video guides. We can take you through some of the features of our software that include tracking project work, using timesheets, using shortcuts for frequently tagged work, a few shortcuts, and how to assign data to work and non-work areas. ManicTime was originally designed as a single-user software, but has since expanded into a robust time management software that can be used across an organization. More than that, we are constantly looking for ways that we can improve the application to make it easier to use by the people who are using it the most. The support staff at ManicTime have a feature request forum where users can talk about additional features they would like the ManicTime software to have. Some common feature requests include additional compatibility with various operating systems, alarms when a task has been worked on over the specified limit, and reminders to take breaks every so often. Our support team is active on the forums, contributing to and refining your feature requests for your benefit. Should you have any issues with your ManicTime software or additional questions, the support staff are available and always ready to receive feedback they can use to make ManicTime even better. We are constantly working to make our product not only the best on the market, but the go-to time management software for businesses around the world. Contact us today if you have any questions about time tracking, time managment software, or the ways in which ManicTime could help boost your productivity and improve your business. Your business could be small or large, but nearly every company can benefit from ManicTime.